Purpose: How to view changes for a change order number using ctcLink. Change orders are created manually or automatically when a dispatched PO requires modifications that affect the supplier's shipment to the company. After the change orders are created, they must be approved, if necessary, and dispatched to the supplier. This topic explains how to view the changes for a selected change order number since the last dispatch of the purchase or change order. Enter the desired information into the Business Unit and PO Number field. 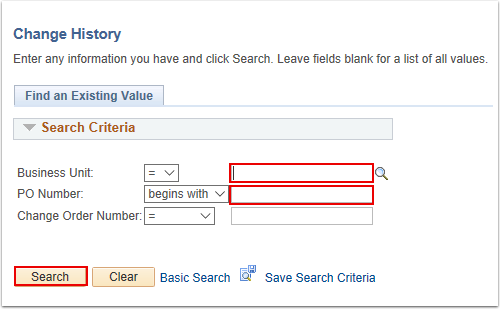 Use the search results to select your desired change order by Business Unit, PO Number, or Change Order Number. Change Order Number column data identify the batches of changes that you make to a requisition. In this example, in the Change Order Number column, select 1. Use the Batch page to review purchase order batch changes. Select the Header Changes tab. Use the Header Changes page to review purchase order header change information stored in the PO_CHNG_HDR table. Select the Line Changes tab. 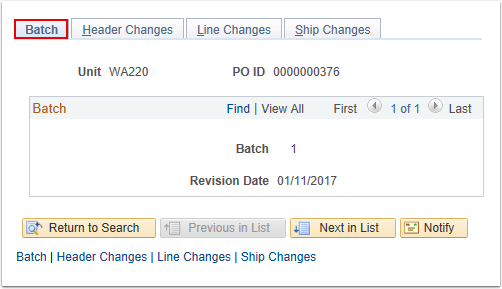 Use the Line Changes page to review purchase order line change information stored in the PO_CHNG_LINE table. Select the Ship Changes tab. Use the Ship Changes page to review purchase order schedule change information stored in the PO_CHNG_SHIP table. You have successfully reviewed purchase order change history for a purchase order.